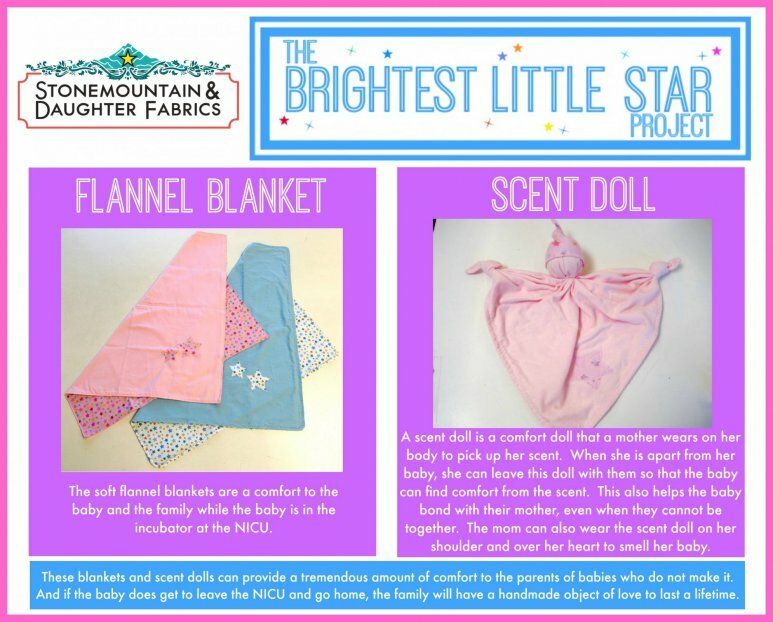 In the past 15 years, the Brightest Little Star (BLS) project has donated over 2,000 small handmade blankets that are presented to parents who have a little one in the Newborn Intensive Care Unit (NICU) at Alta Bates Summit Medical Center. The project is directed by Suzan Steinberg, owner of Stonemountain & Daughter, and founded by Amy Reid, whose son, Jonathan passed away in the NICU in 2001. "This project was inspired by my son, Jonathan who was born on May 31, 2001 at Alta Bates Summit Medical Center. We were blessed to have him with us for two days before he passed away peacefully in our arms in the Newborn Intensive Care Unit (NICU). The cozy but worn hospital blanket that he was cradled in is still a great comfort to me. Since I received so much comfort from my son’s blanket, I wanted to find a way to reach out to provide comfort to other mothers. Over the past three years, thanks to the help of family, friends, and my church, we have given the NICU at Alta Bates Summit Medical Center over 2,000 handmade baby blankets and 1,000 scent dolls. Our hope is that parents who receive these precious blankets and scent dolls will realize there are others out there in the community that recognize what a tremendous loss they have suffered, and want to offer a small bit of comfort at a difficult time. “With every tiny star we appliqué on each blanket we hope to stitch the community together. My hope is that our community service project will bring together women from all over the East Bay and allow them to grow closer by sharing about their 'little stars' and perhaps the memory of some of the tiniest ones who now shine down upon them,” said Reid. “We have approximately 8000 births each year, which means that we deliver a kindergarten class each day - about 20 -22 births,” says Alison Brooks, Clinical Nurse Specialist at Alta Bates. Although the majority of these newborns are healthy infants, there are, unfortunately, about 1,200 newborns that are cared for in the NICU each year. Many of these infants are premature, others may be admitted with infections, or lung problems and a few infants have life limiting disorders. Join us in sewing flannel blankets and scent dolls for babies in the NICU at Alta Bates Summit Medical Center. Fabric will be provided for all volunteers. These simple, soft flannel blankets offer comfort to parents who are going through the stress of caring for a sick infant or who have lost a little one. Our goal is to have a blanket, quilt or scent doll for each of the over 1200 newborns that are cared for each year and you can help! 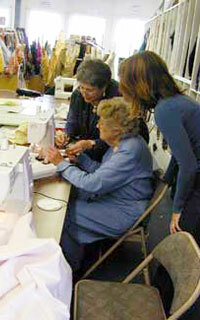 Organize a sewing day with your local sewing guild, school or church group or sew them on your own. Want to learn how you can contribute?